Shingeki no Kyojin, or Attack on Titan. One of the most popular manga series currently and one that brings up more questions than answers every chapter. This peculiar manga was later adapted to anime and now thanks to KOEI TECMO we can now experience this majestic manifestation of action, gore, tension and fantasy in video game form, released on PS4, XBOX One, and digitally on the PS Vita, PS3 and PC/Steam. This is Attack on Titan / A.O.T. Wings of Freedom. 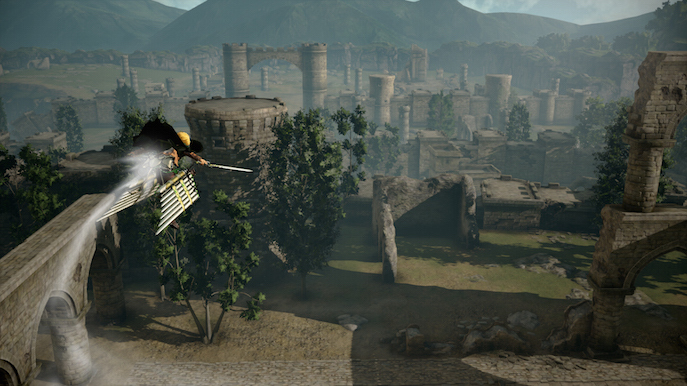 Attack on Titan features a decent amount of game modes worthy of a AAA title. First, you can enter Attack mode which will allow you to play through the story of the manga. The game portrays the lore in such a dramatic and effective way that honestly it could be a decent way to enter this media as someone who is new to the series instead of reading the manga or watching the anime. Cutscenes are well made and mood is established dramatically. 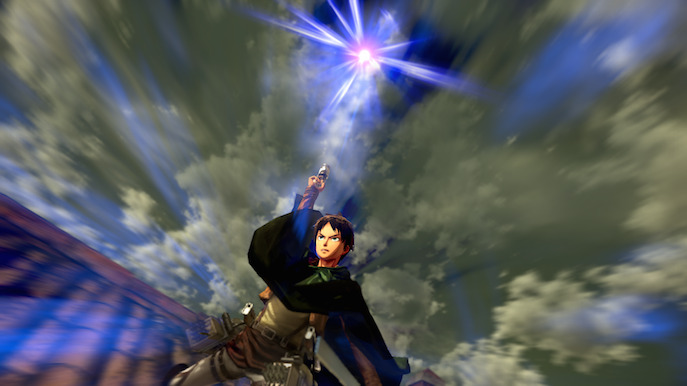 In between the cutscenes, you can play are Eren, the protagonist. The main objective of the game is to defend humanity from the titans, strange giants with varying traits who have one thing in common: to eat humans. 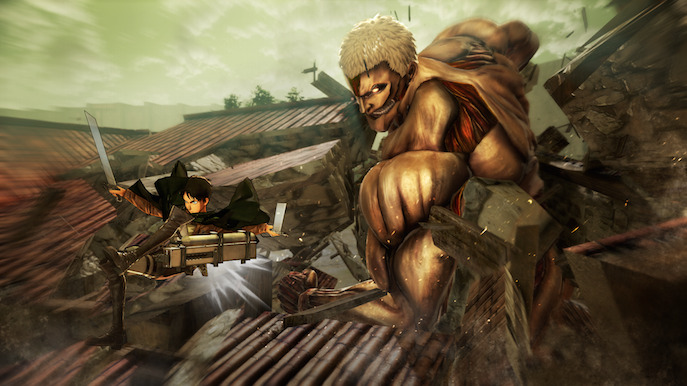 The struggle between mankind and the titans has led to humans building walls to protect them, but everything goes wrong once a new and enormous Colossal Titan appears, and opens a whole in the wall, letting through the chaos. 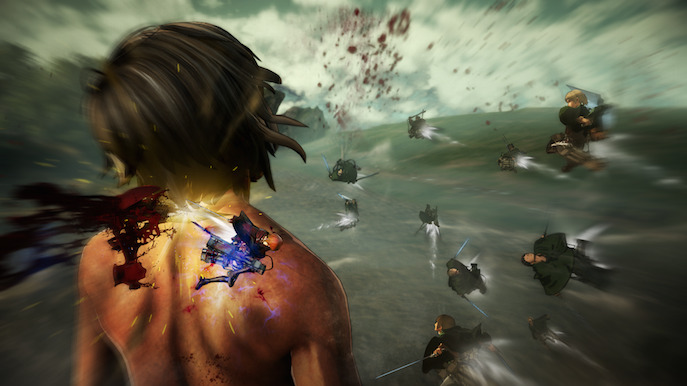 Eren is one of many characters who are enlisted into mankind military, people who use the Omni-Directional Mobility Gear to hook to things and fly through the air, allowing them to get close to titans and kill them by cutting the nape of their necks with two one-edged blades. This is pretty much the whole dynamic of gameplay, you run through town and defend the city by jumping/boosting into the air enough to cut titans down. The game offers the ability to recruit NPCs on the run, whether you want them to attack surrounding titans, guard you, or focus on your target, you’re free to do as you want and be even more effective if you find recruits with a higher ranking. As you progress the game, you unlock new characters, each with different abilities. For example, Eren can transform into a Titan who can use his massive power to kill titans in melee form. Mikasa, Eren’s sister, can cut twice, meaning she can jump from one target to another almost immediately. Armin, childhood friend of Eren and Mikasa, is a strategist, you can aim at a titan’s body part and send other recruits to focus attack on it while you calmly watch from behind. The roster of unlockable characters grows and there are many more with incredible abilities which is surprising considering how much creativity can go on this lore. The versatility in this gameplay expands in how you can cut titans extremities as well, making them easier to subjugate. Killing titans earns you rewards and experience which will level yup your character, earning you new passive skills that make killing titans more enjoyable and funner. Some other rewards include materials, badges and funds. Your main resources are the gas tank for the Omni-DIRECTIONAL Mobility Gear, and the blades. All of these run out over time as you use them, but thankfully there are NPCS around the town who will re-supply them. The fun thing about this is how well implemented it actually is; a game where you are in fear of these giants who only think in eating humans makes for a lot of tension by itself, now imagine running out of gas and blades and having to evade them and then go through the “reload” animation while a titan is behind you getting closer. This builds up and makes for a remarkable experience throughout the game. Once the player finishes a chapter, you can check your stats on how well you did on it. Once you start a new one the game will always find a way to build a “hub” scene, with NPCs with story related lines of dialogue and two merchants: one for equipment and one for materials. The equipment seller will offer you new blades, new Omni-Directional Mobility Gear and new gas tanks, each requiring funds to purchase and they have varying stats, meaning you don’t just buy the “ultimate version” and that’s it, but you can choose one that suits your play style. The seller can also upgrade your equipment, which requires materials that can be found during missions by cutting specific parts of a titan, as chapter rewards or by simply purchasing some from the second NPC vendor. The game also offers multiplayer modes! Scout Mode lets you host or join a party, enter a hub and together can pick a playlist/mission to do. Once in a mission, you can hunt titans, complete specific objectives and earn rewards. The more continuous missions you do, the better the loot. The netcode for the game is very stable and fluid. Connectivty between parties depends on the internet connection but it works most of the time. The one thing I did find a bit off and that can kind of ruin the immersion of the game is that you can sometimes hop into groups for “beginners” and yet some teammates will be dealing massive amounts of damage to titans and carrying you through high rank missions, earning you high rank materials without you even doing any sort of help. This can be useful for people who want to boost friends up but for others it would be just easier to keep at the campaign and grind until you feel safer to hop into multiplayer. 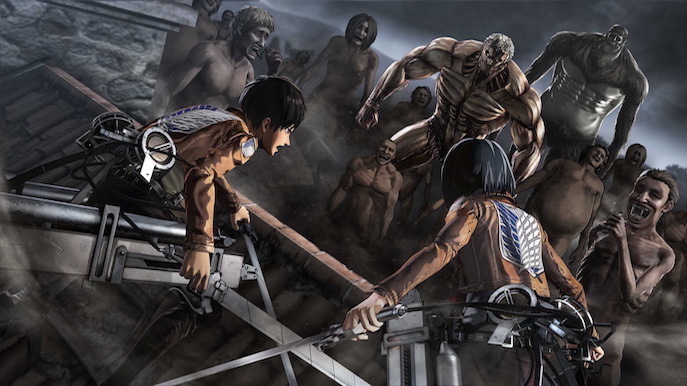 This series is popular for many things, one of it is its art style and gore, which on this version of the game it does has heavy amounts of blood that can be censored via an option, but for those who don’t get bothered by it will be a bit disappointed that key moments of the anime in cutscenes are either censored or straight up cut, but these are all aspects that come to place when rating the game, and many of the censorship was most likely had to be done. In terms of the visuals, the shading on characters with the dark outlines makes them stand out nicely in contrast to the environment and still feel like part of the immersive chaotic world. 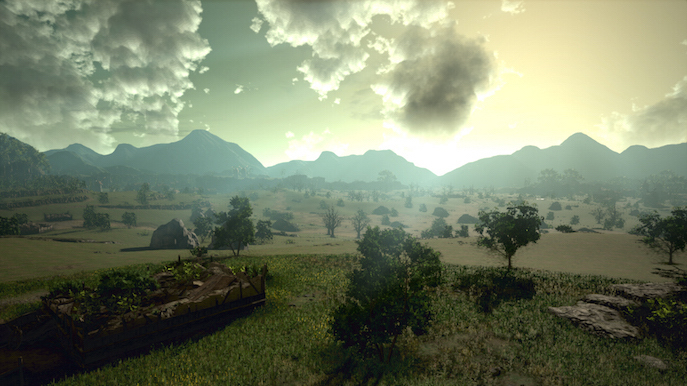 The color palette flows between warmth colors and de-saturated tones, the pacing between these is subtle and effective during gameplay and the campaign mode. A story this sinister does have to have a mix of audio cues and music relevant to its theme, which in this case does pretty well. Nevertheless, the game features how strong humanity can be to stand up and defend themselves, portraying strong heroic scenes with amazing heroic music cues that pump up your play style. Attack on Titan has been a fantastic read and view on manga and anime, and now being able to finally experience a full-fledged game feels amazing. The game gives the series the justice it deserves, it demonstrates the main aspects of the lore in a satisfactory way. 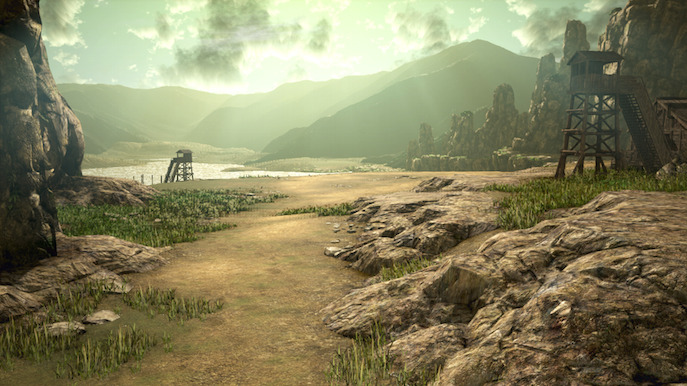 The gameplay is immersive, dynamic, fun and has a great pace in keeping your momentum up Attack on Titan / A.O.T. Wings of Freedom is an incredible performance of fast pace action, tension building, and a great rewarding feeling.